Saba joined the Humanitarian Leadership Academy as the first CEO in September 2015 after 22 years of frontline response to humanitarian crises. 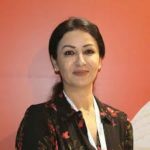 Saba was previously responsible for the overall direction, leadership and coordination of Save the Children programmes in Jordan for both development and humanitarian response. Saba is fluent in Arabic and English, and was educated at Jordan University and the University of Framingham in Boston, USA. Throughout her 20-year career in the fields of engineering, development and humanitarian response, Saba has worked in some of the most challenging countries and territories in the world, including Lebanon, Jordan, Egypt, Palestine, Yemen, Tunisia, Libya and Azerbaijan.